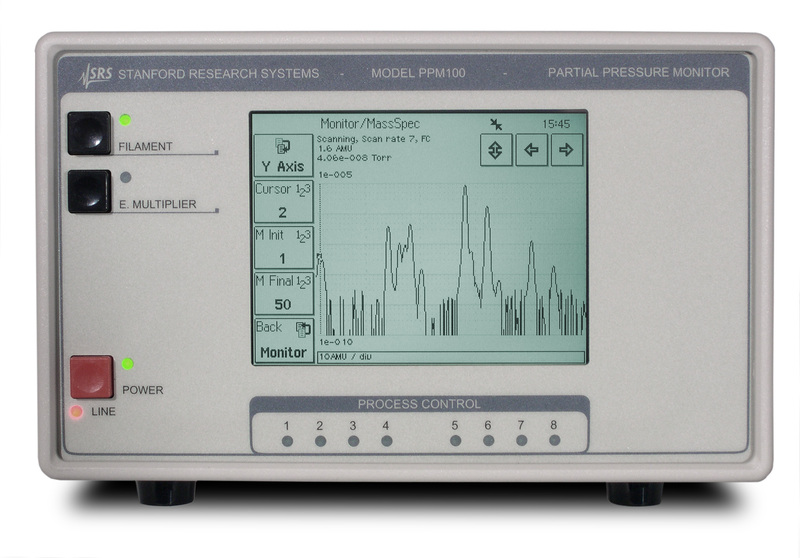 The PPM100 is a stand-alone controller/monitor for SRS residual gas analyzers. It measures partial pressures from SRS RGAs and total pressure from up to four capacitance manometers. Graphical output is available on a touch screen LCD display. 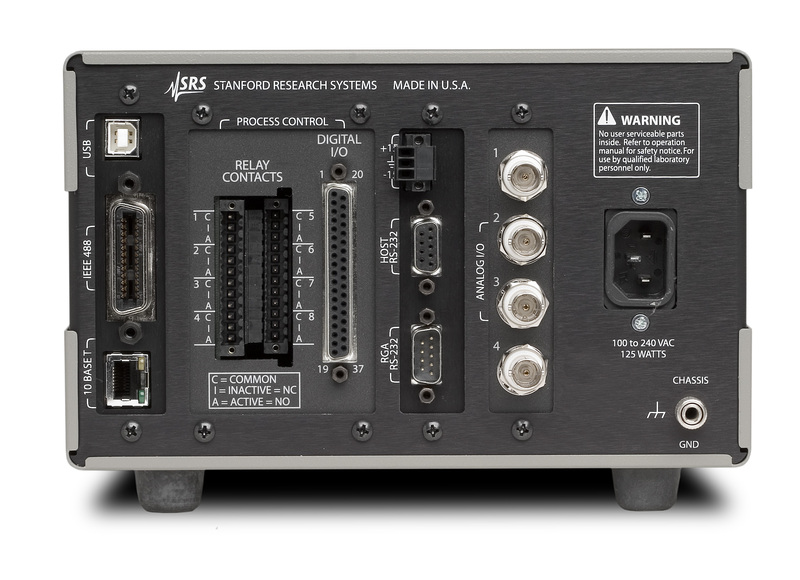 The PPM100 includes 8-channel process control capability, four analog I/O ports, RS-232, USB and GPIB computer interfaces, and a web interface. The PPM100 is designed to monitor and control a single SRS RGA. A menu driven user-interface allows the operator to easily program RGA parameters from the front panel (i.e., no host PC is required). RGA data can be viewed as an analog scan, partial pressure vs. time, leak trend (w/ audio signal) or single mass readings. This data can also be linked to alarms, process control relays, and analog ports for closed-loop control of specific component gases. Data from all gauges (and all analog inputs) is stored at a user-defined rate. Typical applications include capturing pump down or venting curves, monitoring mass flow controller signals during deposition processes, and monitoring temperatures and other time dependent variables during bakeouts or heat treatments. The PPM100 provides eight relays with corresponding TTL outputs. Each channel can be linked to a specific partial pressure, status conditions (like filament on/off), the system clock, the analog I/O ports, or TTL input signals. The relays and TTL outputs can also be manually controlled from the front panel, and the status of all eight channels can be displayed. Additionally, there are seven TTL inputs for triggering functions like filament on/off, degas, etc. All process control events are time stamped and recorded in memory and can be viewed at any time. User-programmable audible alarms and text messages can provide advance warning of potential problems. A built-in embedded web server connects the PPM100 to the world wide web (password protected). The EWS can deliver measurement data to any standard internet browser. Use the EWS to monitor and control your vacuum system or to get automatic email notifications of potential or real system problems. Number of channels 8 channels with programmable setpoint, polarity, hysteresis, delay, audio signal and text messages. Input signals Total pressure (CM gauge), partial pressure (RGA), voltage (analog I/O ports), time (internal clock), TTL and gauge status. Manual control All channels can be operated from the front panel.